Very few characters born of the current generation of games have come close to hitting the iconic heights that Ezio Auditore has hit. The Italian nobleman-turned-assassin is not only the face of the franchise, he is one of the most intriguing and compelling characters in recent video game history. We watched him grow from a carefree rich kid to a weary old man. Seldom has gaming offered as compelling and complete a narrative. Ezio’s journey was, and will remain, an important milestone for gaming that will be hard to recreate. So Ubisoft isn’t going to try. The character of Ezio was an action hero. He was James Bond with a hidden blade, dashing through a rich and lush period of history that combined beauty and intrigue, and featured just enough familiarity that most gamers could appreciate it, even if the details were mostly unknown to them. Copying that formula would be a difficult task, which is why, for Assassin’s Creed 3, Ubisoft is going in an entirely new direction. 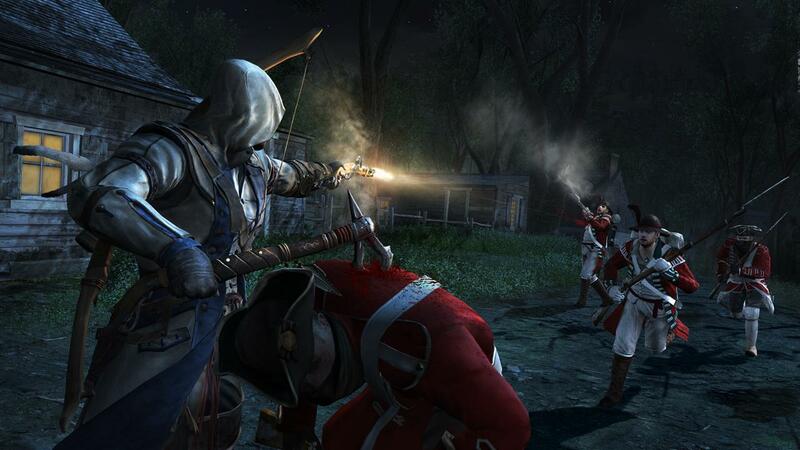 Earlier this month, Ubisoft quietly showed off Assassin’s Creed 3 in private events for press. Under the threat of death (professional death, that is, courtesy of ironclad NDAs), the press was sworn to secrecy over what they saw. It was a solemn vow, and one that we lucky few accepted with the proper amount of gravity. Naturally, all the details leaked almost immediately. The inaugural leak was the first glimpse the cover art that was part of an exclusive preview given to Game Informer. It gave us the time period and a look at the character, but very little else. That didn’t stop us from making a few educated guesses, of course, but the only real confirmation was that it would be set during the American Revolution. We can now reveal what we know, which gives us a solid — albeit still somewhat incomplete — picture of what to expect from Assassin’s Creed 3. And there is a lot to be excited about. If you are worried that the new Assassins Creed is simply more of the same, as the last two games in the series were, you can rest at ease. 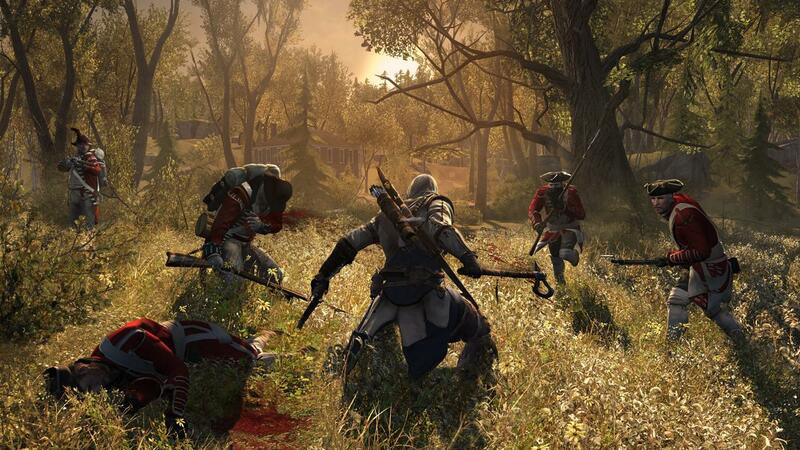 Assassin’s Creed 3 is a new game in almost every way, and Ubisoft has rebuilt the title from the ground up. Beyond just the new hero and setting, the game has a brand new engine, the combat has been totally reworked, and even the way the protagonist moves is built from scratch. “By the time we finish it will be three years working on AC3 for us, which makes it the longest dev cycle since AC1,” Alex Hutchinson, Creative Director for Ubisoft Montreal said. The game will feature all-new animations in every facet of the gameplay, and new motion capture technology will be paired with facial animation from actors. While it is still quintessentially Assassins Creed, it is a new game in every way, completely rebuilt from the ground up. The new protagonist in Assassin’s Creed 3 is a half-English and half-Native American, and the story of his genealogy will be a main part of the narrative. His birth name is Ratohnhaké:ton, but will know him by his English name, Connor. The story will begin with Connor as a child in the Mohawk Valley in 1753. Following a massacre of his tribe, Connor leaves his people — not for revenge, but to fight for freedom and justice. Much like Ezio in Assassin’s Creed II, AC3 will follow Connor from his adolescents through his recruitment to the assassins, and well into adulthood. The game will run the course of three decades, concluding in 1783, after the end of the American Revolution. Where Ezio was a dashing hero, Connor is more earnest and thoughtful. He is a true good guy, motivated by his desire to help others. The contrast between the characters is obvious. Ezio was never without a pithy reply or comeback to a taunt, while Connor is far more taciturn and what he doesn’t say will be as important as what he does. Connor’s heritage will also be reflected in his movements, including his fighting style. Along with the traditional hidden blade Connor wears, he will also carry several other weapons, including a tomahawk. The time period also features firearms, and Connor can use them after they drop from the hands of slain enemies. A musket can become a deadly weapon in the hands of the assassin, but generally he prefers a more reliable and accurate bow and arrow. The combat has been rebuilt from the ground up to offer a more flowing take on the assassin style. You will no longer be able to simply block and wait for a parry over and over again; instead, you will need to utilize the two handed combat and link moves together. The result is a flowing ballet of destruction, as Connor can decimate a small troop in a matter of seconds. In a video displaying the combat, Ubisoft showed Connor wade into a group of enemies and use their own weapons against them. After a few parries and tomahawk hits, he then grabbed a musket from a soldier, planted it in the ground, pulled the enemy over it to fire, and was on to the next enemy before the previous soldier even hit the ground. Unlike the previous games in the series, the land between towns is going to come alive, and the frontier is considered to be as integral an area as any of the towns you can visit and explore. There will be numerous settlements and tribal villages to explore, and the frontier alone is one-and-a-half times the size of Rome from Assassin’s Creed: Brotherhood. Connor is a child of the forest as much as Ezio was a child of the Italian cities he inhabited. As such, he can move through the forests as easily as Ezio or Altair could move through a city. The forests are a playground for an assassin like Connor. He can run up a tree and across branches. He can swing down and attack, or silently stalk prey from elevation while hidden by foliage. Rocks and boulders are also going to play a big part, and Connor will be able to scale these natural walls using realistic techniques. “The new [climbing] system is based on real rock climbing experience researched by the team, with a view to allow more natural, flowing movement,” Jonathan Cooper, Animation director on AC3 said. While running you can move over or under obstacles without breaking your speed, giving you a parkour-like feel to the game that promises to be more fluid than in the previous Assassin’s Creed titles. There are also specially triggered events sprinkled throughout the game, which only become available at the right moment. The example shown featured Connor on the run from a group of British guards through the streets of Boston. After a quick run up the side of a building, he then dove through an open window and past a startled resident, before jumping out the opposite window. This option will only be available in certain situations, and seems like an evolution of the wells, and other areas you could hide to avoid detection in the previous games. And speaking of detection, Ubisoft has confirmed that there will be no tower defense-like mini-games as there were in Assassin’s Creed: Revelations. This is a good thing. The turning of seasons will also be a new feature for the series, and every area will have a summer and a winter. Beyond just the obvious difference that comes with the look of the seasons, there will be weather elements that affect the gameplay. Fog will be present, as will rain, but neither will be as relevant as snow. Moving through the snow will take effort, and it can either be an obstacle for you or a potential trap for your prey — and you won’t just be hunting human enemies. Connor is a skilled hunter and can kill animals like bear and dear, then sell their hides in the city. How the monetary system will be handled is still being kept under wraps, but it appears that you will be able to earn money in new ways like selling animal pelts, much in the same way that Red Dead Redemption did. Along with the frontier that will be dominated by wildlife, Native American tribes, scattered settlements, and the odd roving British army, both Boston and New York will be fully interactive and explorable cities. Philadelphia won’t be open to explore, but you will see it during the game. Even if you are from Boston or New York, don’t expect to be familiar with the 18th century version of those cities. There will be a few landmarks that have remained throughout the centuries, but for the most part, the cities won’t be anything like they are today. The AC3 crew painstakingly researched the cities as they were, and attempted to create a world that felt authenticate and true. There was even a huge amount of effort to attempt to faithfully recreate what the accents of the time would sound like, as they have changed dramatically from then to now — both for the Americans and British. Connor will find himself interacting with many of the most important characters in American history. Ubisoft is determined to keep the historical side of the game as grounded in realism as possible, so the majority of the characters will be based on real people, and they will also be locked into their real life roles. So while you will come across Benjamin Franklin, it will only be for a brief moment as the real-life Franklin spent most of the war in France, drumming up support. George Washington will play a major role, but he may surprise some that are mostly aware of the myth of Washington rather than the man. The Revolutionary General will find himself riddled with doubts, and Connor may prove to be an invaluable ally and confidant. One character that is shown early and often is that of Charles Lee. Unless you are a true history buff, the name might not strike many chords, but America would not be the place it is today without Lee. At the time, Lee was considered by most to be one of, if not the, leading military mind in the Continental Army. But his scruffy demeanor and mercenary-like attitude contributed to losing the job of Commander-in-Chief to Washington (along with Washington’s charisma and ties to the Southern States), something Lee never truly accepted or got over. Lee’s life is intertwined with Connor’s in ways that haven’t been fully explained yet. One early image shows Lee and a very young Connor in what appears to be a heated exchange, but historically, Lee married the daughter of a Mohawk chief, which would presumably have him connected to the same tribe as Connor. A later video then showed a deeper relationship between the two, as Lee and Connor were seen discussing the assassination of a British officer. The details of how aren’t entirely clear, but Lee will play a crucial role in the development of Connor, and appears to be one of the most prevalent supporting characters. Ubisoft is determined not to yield to the popular mythology of the period. There will be good and bad Americans, just as there will be good and bad British. The romantic way we look at the American Revolution and the Founding Fathers will be deconstructed, giving us a more honest and thoughtful portrayal of the times. 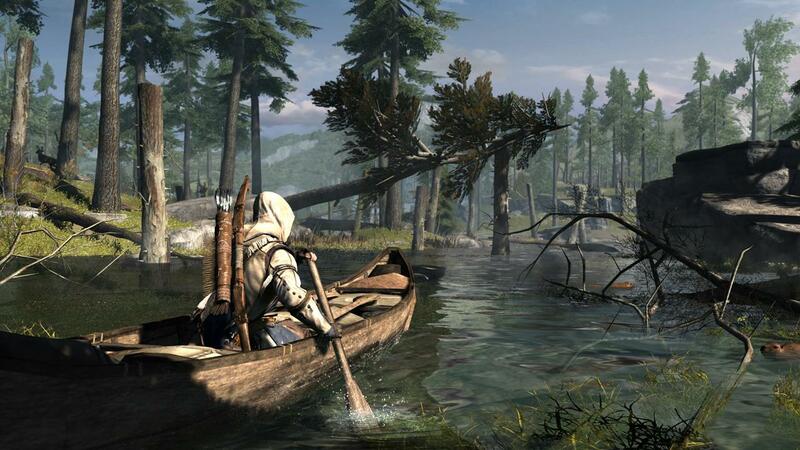 Assassin’s Creed 3 introduces a new engine to the series, the AnviNext, which will debut with the game. Along with all the refined graphical improvements you would expect from a new engine — things like more intricate facial animation and better fabric and environmental details — the engine will also allow more characters and movement on screen than ever before. Ubisoft boasts that it will allow up to 3,000 characters on screen at once, which (besides being just mind-blowing to see) creates new gameplay options. As you wander through the streets of Boston, you will be surrounded by hundreds of characters, each moving to their own rhythm. Merchants will try to attract your attention while dogs (a first for the series) roam the streets. The city feels alive, far more so than in the previous games where a few dozen groups moved in predictable patterns. It is a huge advancement for the engine and the series. But far more importantly is the new option to recreate war. In the demo shown, Connor and General Lee stand on a hill, looking down at what history would come to know as the Battle of Bunker Hill. Lee tells Connor that the target, a British officer that earned the assassin’s attention for reasons unknown, was in the British camp on the other side of the battle and was therefore unreachable. Connor chides Lee for doubting him, then sets off into the middle of the battle. The scene all around is pure insanity. Rocks offer the only cover from incoming British fire, which you can anticipate by watching the formed columns and waiting. If you have ever seen, read about, or heard about the battle tactics of the era, you will understand the timing: one row of soldiers fires, the next moves forward to take aim while the first reloads. Step by bloody step they advance on the Americans, who are far more haphazard in their formations. Connor timed his movements to avoid the cannonballs and musket fire, and soon reached the safety of trees on the edge of the field of battle. A quick climb up, and he found himself above a group of incoming British troops. Showing off a new weapon based on a Chinese rope dart that Connor can throw like a javelin, one enemy went down before he knew what was happening and Connor used him as a human shield to block the musket fire. After easily dispatching the Red Coats, it was on to the British camp. Tall grass and other environmental features can be used to stay unseen, and Connor uses that to his advantage while looking for his target. Once identified, Connor then burst out of the brush, ran through unsuspecting enemies, then jumped off a rock and brought his tomahawk to bear on the officer’s head to end the demo. It was impressive. While the American Revolution is the setting, the war is not the focus of the game. The demo and trailers shown thus far have made Connor look like he is firmly on the side of the Colonists, but Ubisoft promises that it will be more complex than that. 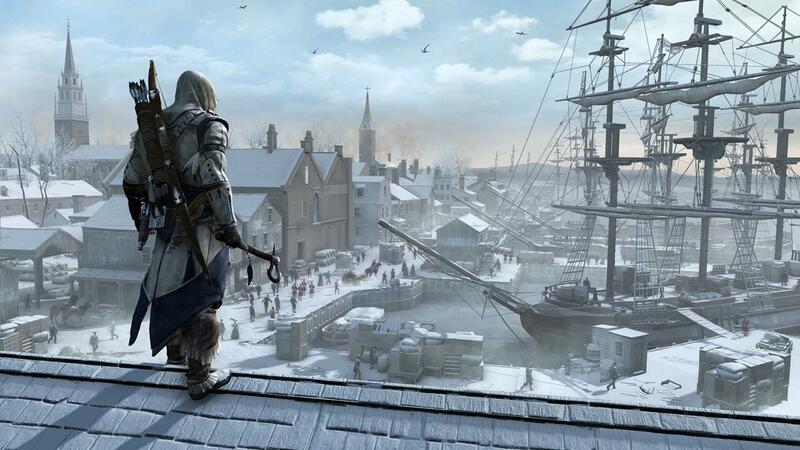 The demo being shown was specifically designed to introduce Connor and his world, but Assassin’s Creed 3 will also continue the story of Desmond, who over the course of the series has been working towards preventing a Templar plan from reaching fruition in 2012. Ubisoft is remaining quiet on what they have in store for him, but he will once again play a major part as the ongoing battle between the Templars and the assassins continues. 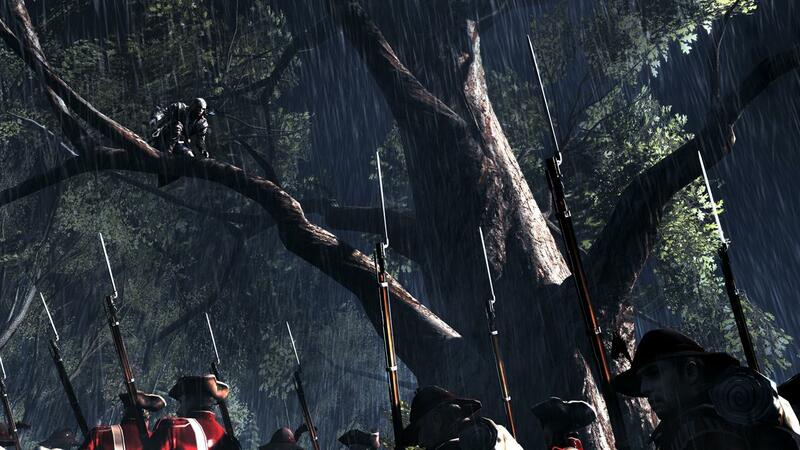 What we have seen so far of Assassin’s Creed 3 is just a small sample of what is in store. Ubisoft has claimed that what it showed was less than one-third of the new features and elements that will be included in the game. With E3 and Gamescom coming later this year, we should be seeing more from this game soon. Although October will be here before any of us know it, Ubisoft is going to squeeze every last second it can to release the best game it possibly can, both in terms of content and quality. There is still a great deal we don’t know about Assassin’s Creed 3. There will be a multiplayer mode, but the details are still scarce. The “Brotherhood” mechanic that allowed you to use other assassins is gone, but there will be something in its place — whether that means other assassins, or simply another mechanism that replaces it as a special attack, is unclear. We will find out more in the coming months, but for now you can go ahead begin counting the days until Assassin’s Creed 3 hits stores on October 30. Can you really make a 'personal' social network?